Live in HD at the Clark. Balanchine Jewels launches a new series for the museum. On Sunday, September 23, at 1 pm, the Sterling and Francine Clark Art Institute’s new Ballet in HD series begins with a broadcast of George Balanchine’s Jewels. 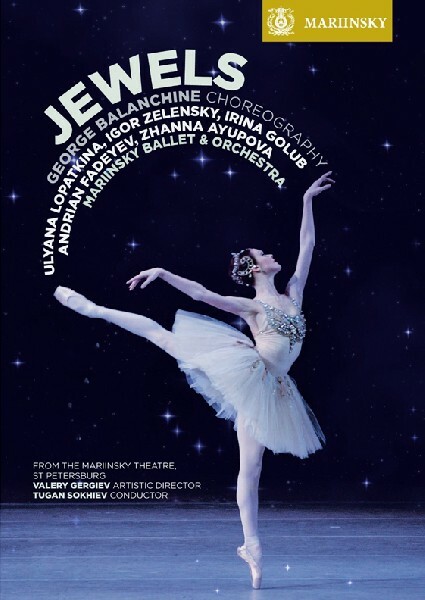 Known as one of Balanchine’s most revered ballets, Jewels is performed by the famed Mariinsky Ballet and is set to the music of Fauré, Stravinsky, and Tchaikovsky. Running time is 92 minutes. Tickets are $15 ($13 members and students). For tickets, visit clarkart.eduor call 413 458 0524. Before emigrating to the West, George Balanchine studied in Saint Petersburg and was a member of The State Academic Theatre, now known as the Mariinsky. Jewels dates from late in his career as a choreographer and was premiered at the New York City Ballet in 1967. Although it did not receive its first performance at the Mariinsky until 1999, it has since become a core part of the company's repertoire. This performance was filmed by Brian Large at the Mariinsky Theatre and features many of the Mariinsky's most well-known dancers alongside conductor Tugan Sokhiev and the Mariinsky Orchestra. Jewels consists of three acts: “Emeralds,” “Rubies,” and “Diamonds,” each representing one of the three golden ages of dance. There is a stark contrast in composition and style for each of the three acts, linked only by the dancers' dazzling costumes encrusted with colored gems corresponding to the title act. For the opening act “Emeralds,” the dancers appear in long green tulle skirts. The demure choreography is reminiscent of the 19th-century French school in its languid and flowing appearance and is set to the music of Gabriel Fauré. Stravinsky’s Capriccio for piano and orchestra accompanies the playful second act “Rubies.” Full of character and wit, its striking angular poses bring to mind the modern New York scene. “Diamonds” evokes the classical era of Imperial Russia, and the dancers, dressed in flat white tutus, sparkle along to the last three movements of Tchaikovsky's Third Symphony. The Mariinsky Ballet (formerly known as the Kirov) is probably the world's greatest ballet company with an astonishing heritage and home to many of the most celebrated dancers. The ballet tours regularly, as well as performing throughout the year in Saint Petersburg.